Lobster a favorite of many New Englanders. But, out East it would be lobsta. Get the best from Maine. 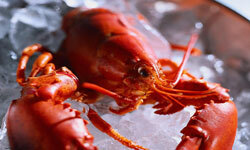 Great seafood from the Lobster Net.Click here. For the freshest Lobster anywhere around. Their lobsters are caught off the coast of Maine and Southern Canada then packed & shipped overnight directly to your home. They also carry surf and turf, crab, appetizers and more. Check them out you won't be sorry.